Comments: Clean, unmarked copy. In great shape! I can send expedited rate if you chose; otherwise it will promptly be sent via media rate. Got any questions? Email me; I'm happy to help! ATTENTION: A discount may be available for this item. Email me for details. 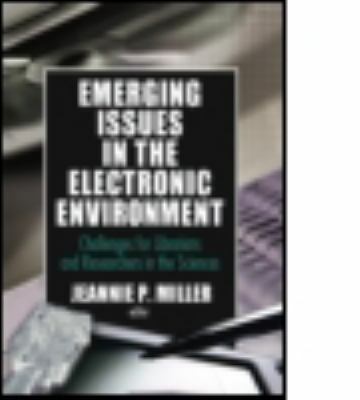 Examining rapid advances in the ways sci/tech library users seek information, this book covers everyting from e-journals to how the data collection process has been simplified.Miller, Jeannie P. is the author of 'Emerging Issues in the Electronic Environment Challenges for Librarians and Researchers in the Sciences', published 2004 under ISBN 9780789025784 and ISBN 0789025787. Loading marketplace prices 5 copies from $36.74 How does the rental process work?